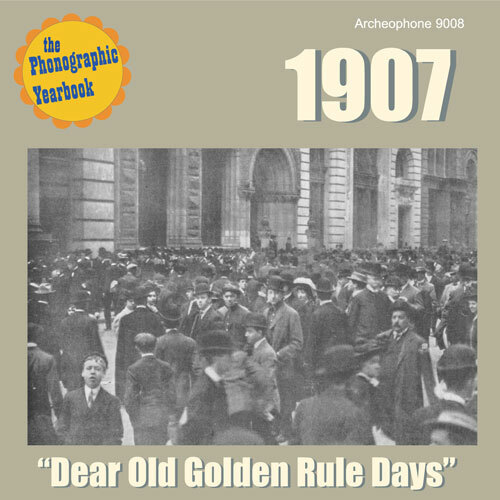 In 1907, New York’s financial districts needed to be taught the Golden Rule, as an October run on the Knickerbocker Trust Co. precipitated one of the biggest depressions in U.S. history. When the panic transpired, President Teddy Roosevelt was on a two-week nature expedition down the Mississippi River. Meanwhile, in homes across America, people were listening to Billy Murray, Ada Jones, Byron Harlan, and the newly-arrived sensation from the highlands of Scotland, Harry Lauder. What adult today doesn’t remember singing “School Days” in his or her youth? This classic song of nostalgia for the rigors of “readin’ and writin’ and ‘rithmetic” was composed by Will Cobb and Gus Edwards and first heard in 1907. Byron G. Harlan, who performs it here, had perhaps his biggest successes this year. With “Nobody’s Little Girl” and Paul Dresser’s heartbreaking swan-song masterpiece, “My Gal Sal,” Harlan had phonograph listeners shedding many a tear. For many of the performers included here, their recordings during 1907 marked a first. “The Bird on Nellie’s Hat” was the first release by new vaudeville star Helen Trix. For Harry Lauder, “I Love a Lassie” was his first recording released stateside (although it was made in 1905). Meanwhile, “The Bully” (an 1896 smash) was from May Irwin’s first and only set of sessions for Victor. For the U.S. Marine Band, “Maple Leaf Rag” was from the first sessions for the outfit after a long absence from recording. And finally, the sketch, “Three Rubes Visiting New York” is taken from the first batches of releases for the new Indestructible cylinder company. “Auld Lang Syne,” “My Irish Rosie,” and “Merry Widow Waltz” are tunes that have stood the test of time. Here they are in versions nearly one hundred years old. These are recordings made by the most significant of early phonograph personalities: Frank C. Stanley, a singer of solo songs, duets with Henry Burr, and quartets with the Columbia Quartet; Ada Jones, already the most popular of all female singers, and newly introduced as a partner with Billy Murray; and the Victor Orchestra, ably conducted by Walter B. Rogers. Nowhere else can you find all these great original songs, by the original artists, on one CD, beautifully remastered and accompanied by a lush, full-color 24-page booklet featuring extensive notes, an essay on the time period, and original source graphics and sheet music.